Australia’s national cake and a national park were named after Charles Wallace Alexander Napier Cochrane-Baillie, second Baron of Lamington. The story goes that, while visiting Harlaxton House in Toowoomba, the Governor had unexpected guests at teatime. The cupboard was bare apart from a stale sponge cake, so he asked the chef to improvise. The chef chocolate-coated the sponge cake, cut it into 5cm squares and added shredded coconut because it was sticky. The result was the lamington, which he named after his vice-regal boss. Lord Lamington has reportedly referred to the cakes as “those bloody poofy wooly biscuits.”* Although perhaps not appreciated by Lord Lamington, these cakes are loved and enjoyed throughout Australia. Preheat oven to 180°C/160°C fan-forced. Grease a 4.5cm deep, 23cm x 33cm (base) roasting pan. Line base and sides with baking paper, extending paper 3cm above edges of pan. Using an electric mixer, beat eggs, sugar and vanilla together for 8 minutes or until mixture becomes thick and creamy. Meanwhile, triple-sift cornflour, self-raising flour and plain flour together. Sift over egg mixture. Using a spatula or whisk, fold in flours until just combined. Fold in butter. Pour mixture into prepared pan. Bake for 25 to 30 minutes or until sponge is golden and just firm to touch. Turn onto a wire rack lined with baking paper. Cool completely. Trim edges of sponge. Cut sponge into 24 squares. Make chocolate icing: Place icing sugar, cocoa, milk and butter in a heatproof bowl over a pan of simmering water. Stir over heat until combined and smooth. Place coconut in a bowl. Using a fork, toss one piece of sponge in icing to coat. Drain off excess icing. Toss in coconut to coat all over. Transfer to a baking paper-lined tray. Repeat with remaining sponge, icing and coconut. Set aside for 1 hour to set. Serve. *reference: Shrimpton, James (6 October 2007). 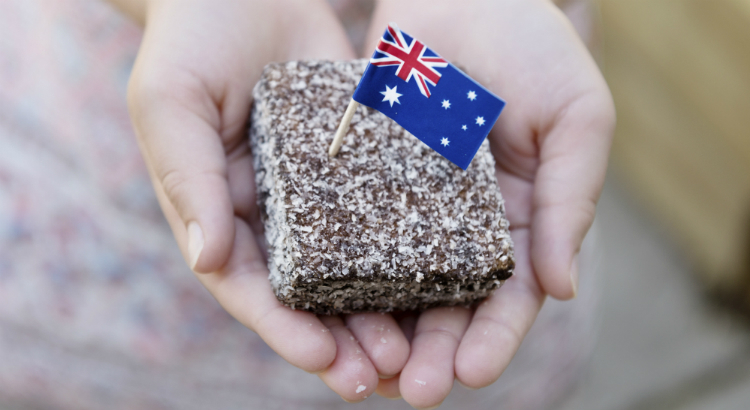 “Australia: The tale of Baron Lamington and an improvised cake,” The New Zealand Herald. Retrieved 13 October 2011. Justine is marketing director and co-owner of Kitchen Warehouse. She loves entertaining and will not refuse a good glass of wine.